In this article, we look at how goldfish mate and the environmental conditions required to encourage goldfish mating. 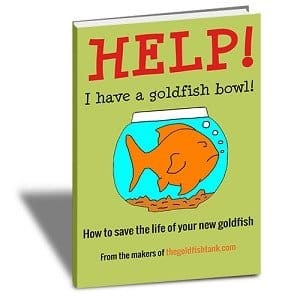 [Read more…] about How do goldfish mate? Goldfish breeding is not an easy task. Unlike livebearers, such as guppies, goldfish can be relatively difficult to breed in captivity. In order to breed successfully, goldfish need their usual quality care – including plenty of space, good nutrition and excellent water conditions – plus specific temperature changes to induce breeding. Before commencing a goldfish breeding program, always think about the amount of tank or pond space available to you. Do you have room for new fry in addition to your existing fish? If not, don’t try to breed goldfish! Do goldfish give birth to live young? Or do they lay eggs? Read on to find out… [Read more…] about Pregnant goldfish: Can goldfish get pregnant? Do goldfish lay eggs? Goldfish lay lots of eggs! 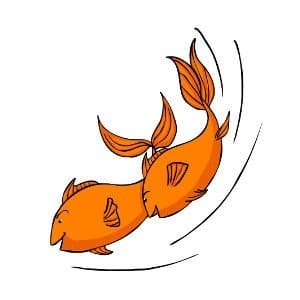 It’s one of our favorite goldfish facts that a female goldfish can lay several thousand eggs in one spawning! However, before you get too excited and look forward to breeding goldfish, we should point out that it’s very difficult to raise goldfish to maturity, breed a male and a female, and have the female lay eggs all within a home aquarium. In order to encourage goldfish to mate and have the female lay eggs, you’ll need quite a big tank, lots of plants, the right temperature, and your goldfish will usually need to be a few years old. You won’t be surprised to hear that goldfish eggs don’t look like the eggs in this picture! Goldfish eggs actually look like small round “bubbles”. They’re clear in color except for a small dark spot in the middle of the egg. 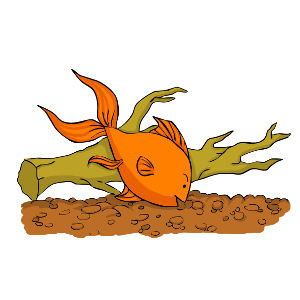 If your goldfish do lay eggs then you’ll probably find them attached to a leaf or piece of plant. 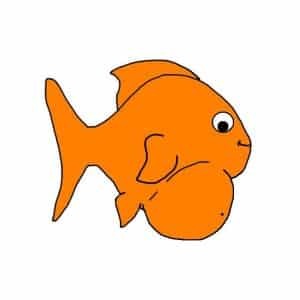 It’s because goldfish lay eggs – rather than live young – that there’s actually no such thing as a “pregnant goldfish”. What should I do with goldfish eggs that I find in my tank? 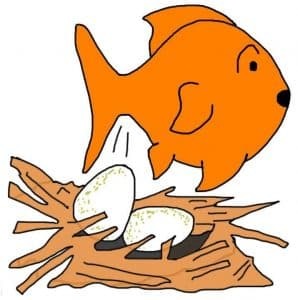 Unfortunately, goldfish will eat their own eggs, so if you want the baby goldfish to have a chance of hatching, you can’t just leave the eggs in the main tank. You must remove the eggs from the tank or pond as soon as possible. Hopefully, you will have prepared a small fry tank before the eggs are even laid. You can find out more about this in our article on goldfish breeding. If you do have a fry tank ready then you can move the eggs – or even the whole plant or spawning mop that the eggs are attached to – and put them into the small tank. If not, you’ll have to quickly find a temporary container! Whatever container you use, you should ensure that the fry tank is a similar temperature to the main tank – between 20°C/68°F and 23°C/74°F. Use a heater to slowly raise the temperature of the water if necessary. Finally, you don’t necessarily have to transfer all of the eggs to the fry tank. Lighter colored eggs have a much greater chance of hatching, so you can dispose of dark eggs and only transfer the lighter ones.